One of the most popular dishes that people all over the world love to eat is Pizza. It is not surprising that our thoughts immediately go to Italy when there is a reference of Pizza. That is because it was Italy that invented this mouth-watering dish that many cannot live without. Thin crust pizzas are a new trend that Is catching up where the base of the pizza is very thin, crunchy and still has a very important role in holding all the toppings together. To get a thin crust, the dough is stretched out gently towards the edges. Pizzas with thin crusts are often a delicacy in different parts of America, such as California, Chicago, New York etc. Usually, the toppings are lesser so that the pizza can handle the weight of the ingredients. Thick crust Pizza is one of the most traditional ways of making a Pizza. The dough or the base is like bread that is loaded with many toppings and different kinds of sauce. The main reason for thick crust is to ensure there are many toppings that can be put on the pizza. It does take longer time to cook, but is equally delicious as thin crust pizzas. Chicken is a smart choice for a pizza topping as it comes in different varieties such as barbeque chicken, Smokey chicken, chicken sausages, salami, etc. These can be combined with a lot of cheese, jalapenos and other vegetable toppings as well. This one is for the meat lovers who would want their Pizza to be heavy and satisfying. Pepperoni can make a very good topping if combined with thin crust Pizzas. Now this topping has been a debated for and against by many pizza lovers. There are some who evidently dislike it while there are some who find the Pineapple on Pizza as a very good option. We leave this up to your taste buds to make the right call. Otherwise called capsicum, Green peppers are also a very good choice as they are very rich in flavour and taste very delicious on a pizza. You could add onion, jalapenos and chilli as well to make it a wholesome dish. The classic form of pizza loaded with cheese is the best option if you are a cheese lover. 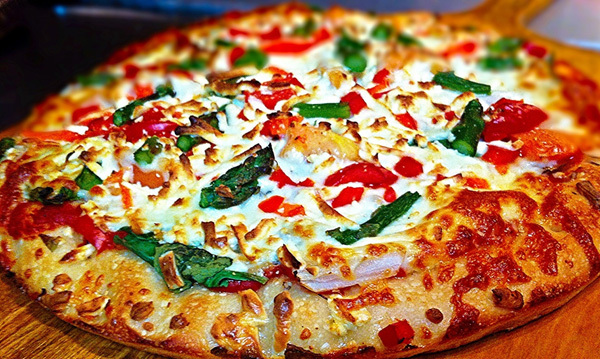 Try feta cheese on a pizza to get a tastier flavour.